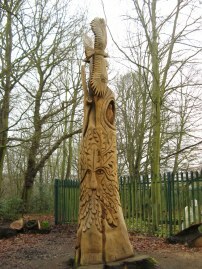 I did this walk on Sunday 20th February. It was a very cloudy, dull grey morning and quite chilly, the car thermometer saying only 4c when I parked up although there was no breeze which helped with the air temperature a bit. From my parking spot in Middle Park Avenue it was then a 0.62 of a mile walk back over to Mottingham Lane where I resumed my walk along the Green Chain Walk at the start of the stage 9. This was now becoming a very familiar spot at it also marks the end point of stage 6 and the start point of stage 8 as well. I was quite looking forward to doing this part of the route as stage 9 is one of only three sections of the Green Chain Walk that I had not previously walked. The stage 9 of the Green Chain Walk is another one of the stages that has two distinct arms however unlike stage 4 which is described as having two end points section 9 is described as having two start points, one starting where I was in Mottingham and the other arm starting over in Chislehurst, the two paths linking up in Elmstead Woods. For this walk I walked from Mottingham to Elmstead Woods and then Chislehurst to Elmstead Woods before heading on to the end of the stage in Beckenham Place Park. Part 1 - Mottingham to Elmstead Woods From the start point in Mottingham Lane, photo 1, I followed the route as it headed off down the road to the left. Reaching the end of Mottingham Lane the route then turns right along Grove Park Road which is followed as the road bends past the buildings of Eltham College before heading to the left along the driveway of Mottingham Sport Ground, photo 2, where a Green Chain Walk sign said it was ½ mile to Elmstead Woods. Reaching the club house the route then continues ahead over the grass between two sets of football pitches that line either side of the park. 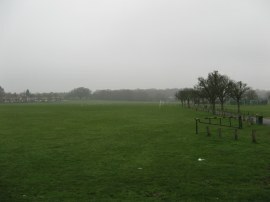 Reaching the far side of the playing fields the route heads to the left along the top end of the sports ground, running for a short while besides a small stream, before turning right into Lower Marvels Wood, photo 4. Where the path splits, the route bears to the right to head up to cross over Dunkery Road before continuing ahead through the trees of Lower Marvels Wood; all the time the path ascending ever so gently uphill. Reaching the end of the trees the route crosses the small residential Castleton Road before heading up between the houses of Calcott Walk, photo 5. 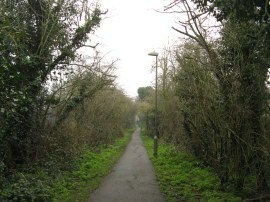 Reaching the end of this, the route heads briefly to the left before heading a short distance up Castlecombe Road. 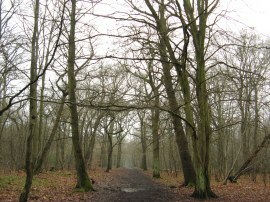 Here the route joins a footpath that bears to the right along a path that runs through the trees of Marvels Wood and into Elmstead Woods. Heading through the trees the route passes a couple of very impressively carved dead trees created by the chainsaw carver Will Lee. 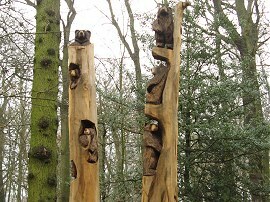 The bear tree, photo 6, was stunning; the photo just does not do it justice and I want one in my garden! 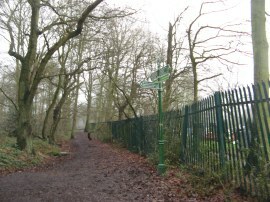 The path makes it way on a slightly circuitous route through the trees round to the edge of Grove Park Cemetery which the Green Chain Walk then follows downhill to the left through the trees. Reaching the bottom of the hill the path reaches the point where the Chislehurst Arm of stage 9 links up with Mottingham arm, photo 8. At this point I had walked a total distance of 2.06 miles which made it 1.44 miles from the start point of the stage in Mottingham Lane. 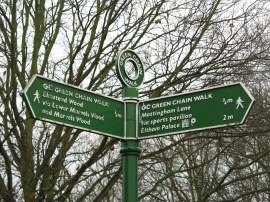 From here I then walked over to Chislehurst to walk that arm of the walk. 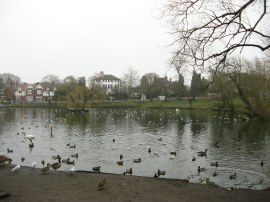 Part 2 - Chislehurst to Elmstead Woods The Chislehurst Arm of stage 9 starts besides Prickend Pond, photo 9. From there the route heads down Chislehurst High Street, photo 10, past the Church of the Annunciation of the Blessed St Mary with its very unusual tower which is slightly detached from the rest of the church buildings. Reaching Chislehurst Public Library the route joins a footpath on the left that heads down to Chislehurst playing fields along a fence lined path with school playing fields on the right and houses to the left. The route then heads to the right, heading uphill through a small band of trees at Whytes Woodland before heading round the right hand edge of a patch of open ground along a tarmac path with trees to the right, photo 11. Leaving the open space the route joins a path on the right which heads along a fairly long straight section of paved footpath, photo 12 running with houses to the right and some large buildings on the left which were just visible through the trees that lining the path. These buildings, once Ravensbourne College, were in the process of being demolished though doubtless something will soon be put in their place. 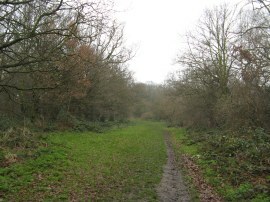 This footpath is followed down to Elmstead Lane where the Green Chain Walk heads to the left before joining a broad footpath on the right running through the trees of Elmstead Wood. 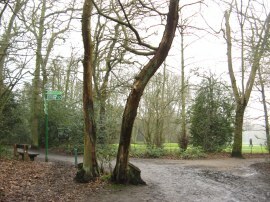 This well marked path is then followed through the trees, photo 13, down to the edge of the Grove Park Cemetery where it links up with the section of stage nine that had started at Mottingham. Having once again reached the point where the two routes link up, photo 14, I noticed the graves in the cemetery to the right of the path where predominantly Turkish at this point which reminded me of the Turkish Cemetery I had passed when walking the Pymmes Brook trail several years ago. Back at the junction of paths the GPS showed that I had walked a further 1.74 miles along the route from the start point of the Chislehurst Arm. Part 3 - Elmstead Woods to Beckenham Place Park With two start arms linked up the route heads alongside the edge of the cemetery for a few more yards before turning to the right along a path running alongside the railways with the cemetery to the right. It was only a few yards along this stretch of path before the route heads to the left across a bridge over the railway lines, photo 15, at the point where the spur from stage 8 that I had walked a couple of weeks ago links up with the route of stage nine. 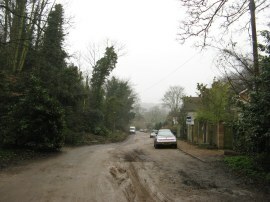 Once over the rail bridge the route joins a road, New Street Hill which is followed downhill for some distance with a golf course on the left and houses to the right. Reaching the junction with Oak Tree Gardens the route joins a path that bears away to the left, running through a patch of scrubby trees with the grounds of the golf course still to the left. 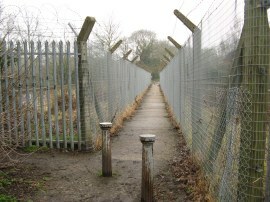 This path bends round to the left, with allotments to the right as the route joins a rather dingy and narrow fence lined stretch of path. Reaching some tennis courts the route heads to the right and takes an old arched footbridge over some railway lines before heading down to Minster Road. 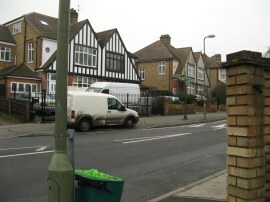 The Green Chain Walk heads straight across this road and joins a fence lined footpath running between the backs of houses which is followed down to Foxbury Road. Here the route then turns sharp right and the quiet suburban street is followed round to Croft Road where the Green Chain Walk heads to the right, the short distance down to Burnt Ash Lane. 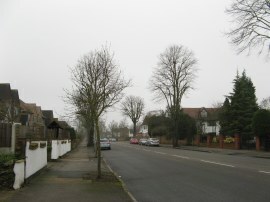 The route heads straight across this road and continues down the very broad Park Avenue, photo 16. 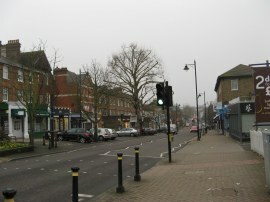 Reaching Bromley Hill the route then continues straight ahead down Oaklands Road. 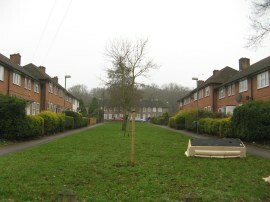 Where Oaklands Road bends round to the left the Green Chain Walk heads to the right along Coniston Road before heading down the first turning on the left which is the unsurfaced Elstree Hill, photo 17. Reaching the bottom of the hill the route heads across Calmont Road to join a broad tarmac path running between playing fields which were busy with Sunday football matches when I went past, despite how they appear in photo 18. 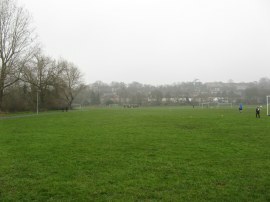 One thing my walk along the Green Chain Walk has shown is the large number of people who take part in Sunday football each weekend in the various open space and parks the path passes through. 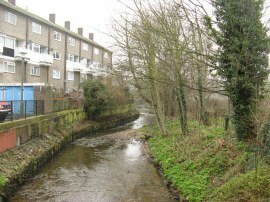 After running round the edge of the playing fields the route crosses over the River Ravensbourne, photo 19, and heads up Ravensmead Road before turning right along Ravensbourne Avenue which is followed for a short distance up to Crab Hill where the route heads to the left. 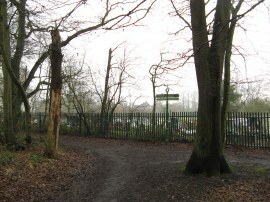 Here the route heads uphill past Ravensbourne Station before joining a broad path heading into the grounds of Beckenham Place Park at Summehouse Hill Wood. The path bends round to the left alongside an open area before soon heading back to the right along a path running through the trees of the park and after a few more well signposted twists and turns through the trees the route reaches the end of stage 9, photo 20, in the middle of Beckenham Place Park where it also links up with the section 8. Reaching this point I had walked a total distance of 8.36 miles which, after deduction the distance to the start of the walk and the mileage to get over to Chislehurst, makes the stage exactly 6.00 miles long. 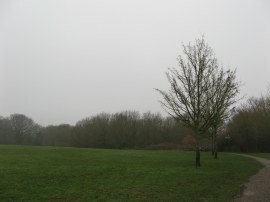 I then headed to the left, following the route of stage 8 through the grounds of the park as I made my way over to the start point of stage 10 of the Green Chain Walk at the junction of Southend Road and Stumps Hill Lane. I have uploaded the route of the days walk, including stage 9 which can be accessed here Green Chain Walk Sections 9, 10 and 11 Route.